The great white shark, also known as the great white, white pointer, white shark, or white death, is a species of large lamniform shark which can be found in the coastal surface waters of all the major oceans. It is really difficult to measure that how large a shark actually is. The reason is simple: they live in water, and it is not entirely safe to get close to them. Safety is one thing, the other thing is their incredible speed: great white sharks can accelerate to over 56 km/h (35 mph). Another difficulty is, their bodies are comprised of mostly water too, so when they are landed the water dries up, and they become smaller. In overall, the great white is the fifth largest living fish on earth. Historically, a number of very large great white shark specimens have been recorded. For decades, many sources including the Guinness Book of World Records, listed two great white sharks as the largest individuals: In the 1870s, a 10.9 m (36 ft) great white captured in southern Australian waters, near Port Fairy, and an 11.3 m (37 ft) shark trapped in a herring weir in New Brunswick, Canada, in the 1930s. Some researchers question these measurements’ reliability, noting they were much larger than any other accurately reported sighting. This New Brunswick shark may have been a misidentified basking shark, as the two have similar body shapes. The basking shark (Cetorhinus maximus) is the second largest living fish, after the whale shark, and one of three plankton-eating sharks besides the whale shark and megamouth shark. 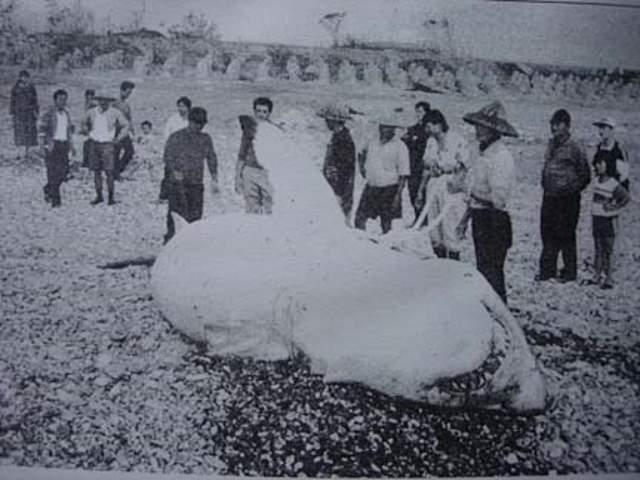 The question of the Port Fairy shark was settled in the 1970s when J. E. Randall examined the shark’s jaws and “found that the Port Fairy shark was of the order of 5 m (17 ft) in length and suggested that a mistake had been made in the original record, in 1870, of the shark’s length”. So, what is the largest great white shark ever recorded? A very large specimen was caught off of the coast of Cuba in 1945. Known as the “Cojimar Specimen”, it allegedly weighed 7,000 pounds (3,175 kg) and was 21 feet (6.4 m) in length. It is often cited as the largest great white shark ever recorded. At the time, an entire village seemed to come out for the photo. Several adults stood at the background, while kids sat on the long-dead shark, legs dangling over the side. But, later analysis of the photo by experts, such as R. Aidan Martin of the ReefQuest Center for Shark Research, suggests the shark fell short of its stated size. Martin instead concluded it measured around 16 feet (4.9 meters) in length, with a weight that’s hard to determine just based on a single photo. According to the American ichthyologist and a leading authority on coral reef fishes, also a shark expert J. E. Randall, the largest reliably measured great white shark was 6.0 meters (19.7 feet), found near Ledge Point, Western Australia in 1987. The great white shark specimen caught off Filfla, Malta on April 17, 1987. First two photos from A. De Maddalene’s archive. The third photo by J. Gullaumier. On April 17, 1987, Alfredo Cutajar caught a big female great white off the coast of Filfla, Malta that was reportedly measured to be 7.23 meters (23.7 feet) long and weighed 2,880 kg (6,349 lbs). In the mid-90s, Cutajar and John Abela were interviewed for a documentary “Jaws in the Mediterranean”. This time, Cutajar has claimed that the shark was 7.01 meters (23 feet) and Abela confirmed that. 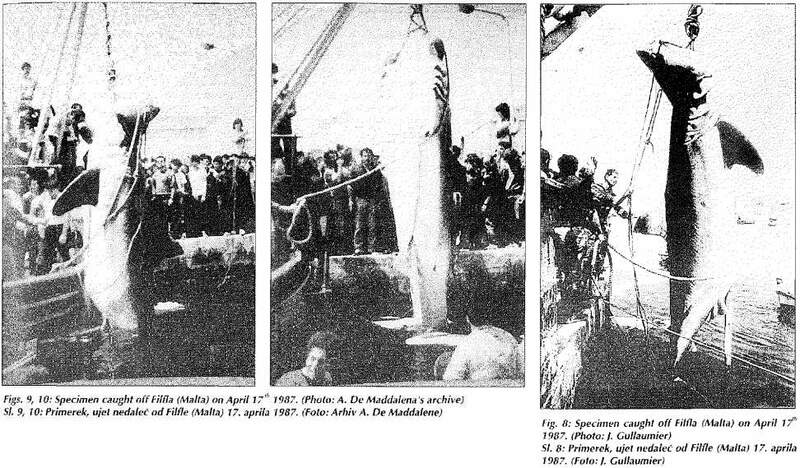 He said that he had accurately measured the shark twice, as it lay on the floor, at 23 feet 5 inches (7.14 meters). In 2001, again, Cutajar said that it was 7.01 meters (23 feet) in length. Later, based a set of its jaws, Spanish shark researchers Joan Barrull and Isabel Mate estimated that the Malta shark was between 6,68-6.81 meters (21.92-22.34 feet) in length. There’s been some dispute about the accuracy of these numbers, however, and experts have been arguing over it for years. 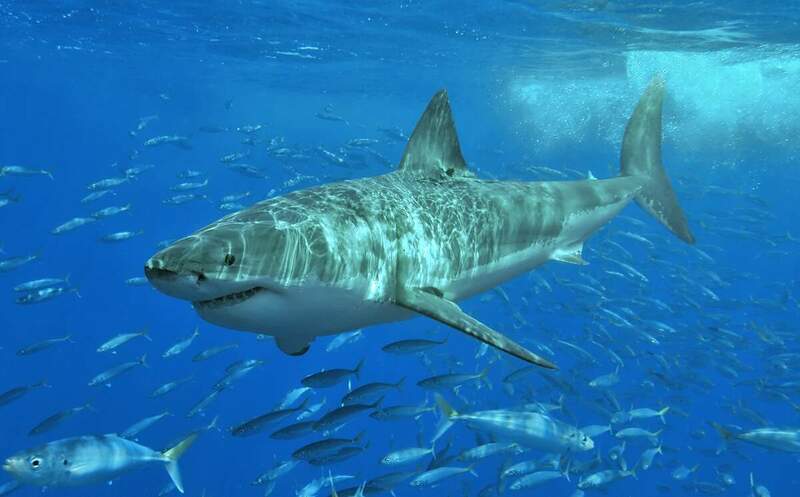 Shark experts Richard Ellis and John E. McCosker, authors of the book The Great White Shark (1991), have also largely discounted the claim of the Maltese fisherman. On May 14, 1997, a huge great white shark caught in a set-net off Hualien County, Taiwan. Gross weight of this animal was 2500 kilograms (5,500 pounds) and total length is claimed at 6.7 to 7.0 meters (~22 feet). This length, however, unconfirmed, and note that forced perspective is used in its only photo. Still, it is considered as possibly the largest great white shark ever recorded. 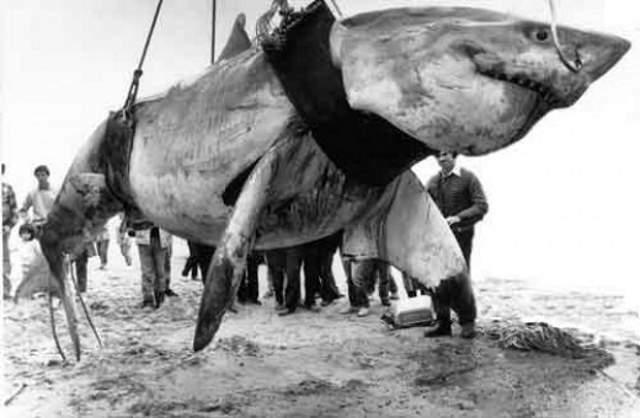 On April 1, 1987, a huge great white was captured near Kangaroo Island in Australia. It was estimated at at least 6.9 meters (23 feet) long. According to Wikipedia, the shark size estimation methods proposed by J. E. Randall to suggest that the Kangaroo Island specimen was 5.8-6.4 meters (19-21 feet) long. In a similar fashion, I. K. Fergusson also used shark size estimation methods proposed by J. E. Randall to suggest that the MALTA specimen was 5.3-5.7 meters (17-19 feet) long. However, photographic evidence suggested that these specimens were larger than the size estimations yielded through Randall’s methods. Thus, a team of scientists-H. F. Mollet, G. M. Cailliet, A. P. Klimley, D. A. Ebert, A. D. Testi, and L. J. V. Compagno-reviewed the cases of the KANGA and MALTA specimens in 1996 to resolve the dispute by conducting a comprehensive morphometric analysis of the remains of these sharks and re-examination of photographic evidence in an attempt to validate the original size estimations and their findings were consistent with them. The findings indicated that estimations by P. Resiley and J. Abela are reasonable and could not be ruled out. In the photograph above, we see a huge 21′ 8″ (6.6 meter) great white shark caught by the Australian shark hunter Vic Hislop in 1985 (still forced perspective is used). This may be the biggest white shark ever caught. Hislop also believes there are many even bigger sharks out there in our oceans. He also claims to have a caught a bigger one than the one pictured, but couldn’t land it. Contrary to the current belief that the great whites are not natural man-eaters, Hislop believes that the great white sharks can develop a taste for humans and that once one does, it will travel from beach to beach devouring humans whenever it feels hungry. He says “At least a hundred swimmers disappear every year here and their bodies are never found. Many have been eaten. I’ve often caught sharks and removed human hands and feet from their stomachs. I even found a human foot still in its sandal.” You can read more about this on the Edit International site. According to the Canadian Shark Research Center, the world’s largest accurately measured great white was 20 feet (6.1 meters) in length. This was a female caught in 1988 at Canada’s Prince Edward Island. It is caught by the local fisherman David McKendrick. The shark became tangled in McKendrick’s net as he fished off the western side of the island, and died before it was brought to the surface. A large female, the shark was a rarity in the northern seas. This enormous shark named “Deep Blue” was spotted near Isla Guadalupe, off the coast of Mexico and is probably the largest great white shark ever to be filmed and believed to be one of the largest great white sharks ever seen. The massive predator was first featured in August by the Discovery Channel in a documentary when researchers tagged the gigantic fish. Researchers believed Deep Blue was pregnant. The shark thought to be around 50 years old and estimated at 20 feet (6.1 meters). Great whites can live to around 70 years old in the wild. But today, sharks aren’t living nearly as long as they used to – and in turn, not growing as large as they once did. In the video below, a fearless diver high-fiving Deep Blue. Photo: Shark Alerts South Australia Facebook page. An Australian crew has photographed what may be the largest great white shark ever seen, at an approximate length of 23 feet (7 meters). The shark was spotted just 300 feet off the shore of Marino Bay, South Australia. The photo was published on Shark Alerts South Australia Facebook page. According to the non-profit organization, “the crew (of the shark patrol helicopter) used their Jet Boat to compare the size which is around 6 meters and the shark was bigger”. In a comment on their facebook page, Shark Alerts South Australia says: “These guys are professionals so I can ensure you no lies on the length here… As stated the “biggest they’ve ever seen”. The great white sharks also known as the great white, white pointer, white shark, or white death. Despite the great white shark is responsible for by far the largest number of recorded shark attacks on humans, many scientists believe that they do not prey on humans. In the Mediterranean Sea there have been 31 confirmed attacks against humans in the last two centuries, most of which were non-fatal. Scientists say many of the attacks are “test bites”, and the fatalities are usually caused by blood loss from the initial bite rather than from critical organ loss or from whole consumption. Humans are not appropriate prey because the shark’s digestion is too slow to cope with a human’s high ratio of bone to muscle and fat. Accordingly, in most recorded attacks, great whites broke off contact after the first bite. However, some researchers have hypothesized that the reason the proportion of fatalities is low is not that sharks do not like human flesh, but because humans are often able to escape after the first bite. In the 1980s, John McCosker, Chair of Aquatic Biology at the California Academy of Sciences, noted that divers who dove solo and were attacked by great whites were generally at least partially consumed, while divers who followed the buddy system were generally rescued by their buddy. McCosker and Timothy C. Tricas, an author and professor at the University of Hawaii, suggest that a standard pattern for great whites is to make an initial devastating attack and then wait for the prey to weaken before consuming the wounded animal. Humans’ ability to move out of reach with the help of others, thus foiling the attack, is unusual for a great white’s prey. Mediterranean Great White Sharks – A Comprehensive Study Including All Recorded Sightings. By Alessandro De Maddalena and Walter Heim. there have been documented sharks 35 feet or larger. There was also a frozen architeuthis dux at 100 feet found frozen in the antarctica in the past. The oceans go VERY deep. There is no way to say what is really alive and what is not. What about the 23″5′ caught and measured accurately in Malta in 1987? A great write-up! Can I use it to update this article?